Recycling at School - Why and How? Recycling at school is easy and fun for all if it is managed properly. “Managed”... oh dear, that sounds like work... of course it is! Running a successful recycling initiative is hard work, but keep in mind that many a hand makes for a lighter load. We have reached a time where people cannot afford to turn a blind eye to the plight of our planet if we do not work together to make a positive change. We are exhausting our natural resources and simultaneously flooding the planet with the remains of our consumed goods. Surely humans should have more respect for the very planet that they live on? Sustainability is key for us to preserve our planet. Teaching humanity to be self sustainable could very well solve a lot of the problems we have created for ourselves to begin with. It is very important for the 3R principles to be embedded in the minds of our youth. 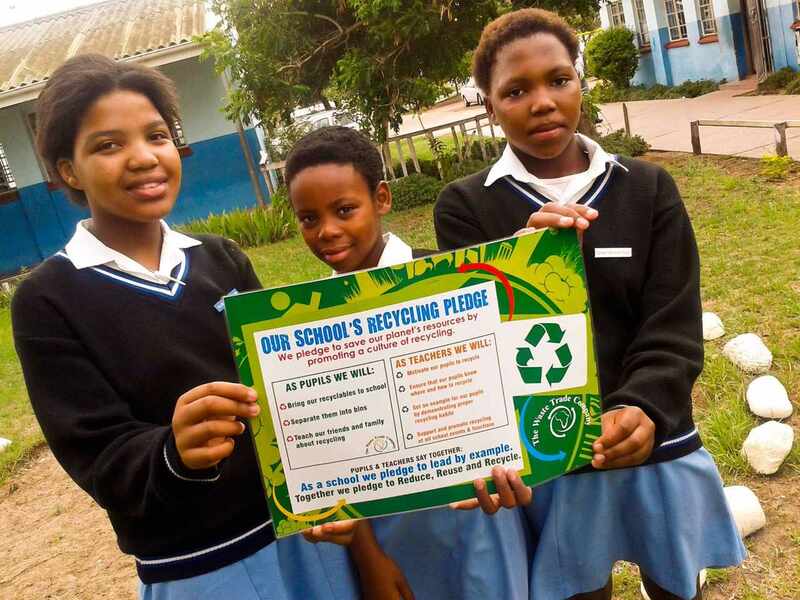 Old habits are known to die hard, but if children cultivate a culture of recycling amongst each other, this will follow through at home and will make a huge difference in the general state of their environment at home and at school. Get Down & Dirty – Do a waste audit at school. Find out what types of waste you mostly accumulate. Collect cans/bottles/paper from students and record what you have collected. Team Up – Your school needs green champions to make this project work. These champions should be acknowledged (badges work well), and they should be given certain responsibilities with regards to the recycling stations, motivating other pupils, reporting littering at school etc. Who you Gonna Call? – TWTC, of course!!! Contact us to come and see you, we can provide you with the needed resources to make your project a success. Educate – Arrange for a launch day to inform all pupils and teachers about your new plan. Invite TWTC to come and talk to the school about recycling for you! Advertise – Sell the idea to pupils, teachers, parents and any other outside parties who would like to get involved. Motivate – Don’t lose momentum! Once you have come this far it is up to you to keep the ball rolling. Have special recycling events at school, do plays, poems, pictures – have competitions at school... there is a lot you can do to motivate everybody to be a part of The Schools Recycling Project!